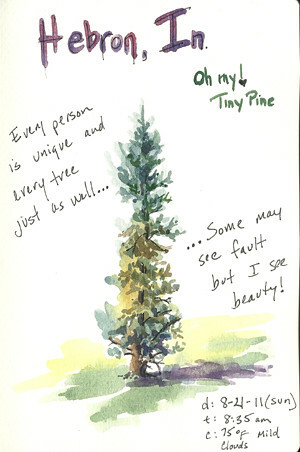 Skinny Pine Sketch – Let's Paint Nature! Sometimes it feels good to get away….even if it is only for one day! That’s exactly what I did last Saturday. I escaped to visit a long time friend in Hebron, In. We had a slumber party and talked for hours…just like we did when we were little kids! Anyhoo, it was my first time visiting her new pad. As I walked up to her house, I was transfixed by the skinniest pine tree in the world! Well, maybe not in the whole woooorld, but you get the idea. It’s about 7 feet tall and I probably could have put my arms around it. We joked and said it was the Charlie Brown Tree, all it needed was a heavy ornament on the very top to make it lean over and droop down. Now to many, this pine is an eyesore…under-developed, not lush, not like the other pines….but I like it all the more! It has character. It’s different. It stands out from all the other pines. It is noticed and appreciated by moi. Wow! He knows us. He likes us the way we were made. So don’t let the “popular/in group” put you down! Do you know who else has character? Chewy does. Chewy has character. This is my friend’s kitty. He is very, very, very friendly and wants to put his smell all over you by rubbing his face on your legs, arms, anything really. He was even putting his smell on each wooden post of this front porch banister! Chewy has a mission to mark everything. ha ha ha ha! I enjoyed the brief time with my friend, the unusual pine, and the very friendly Chewy. I hope you enjoyed these sketches! 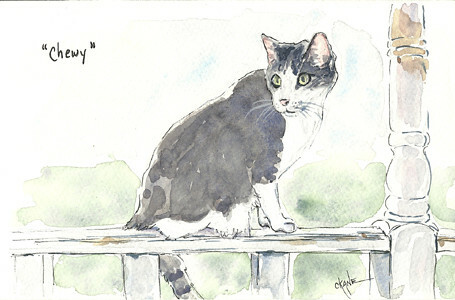 Christine, I really enjoyed your sketch’s and comments! Great Work! He does know us, doesn’t He? I am really enjoying your blog. Trying to learn to watercolor. This blog has been most helpful. Thanks. Love your artwork. I am happy you enjoyed your visit with your friend. It sounds like you two had a great time! Your sketches are lovely. Garyz23: Thank you so much! Thank you for visiting and I hope the lessons help! Michelle: Yes, we had a blast! Thank you!! !